United Yacht Sales New Jersey would love to guide you through a personal showing of this 71' Jim Smith Custom Convertible 2011. 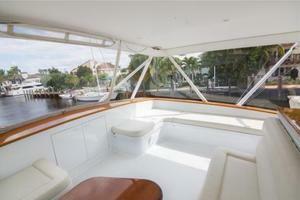 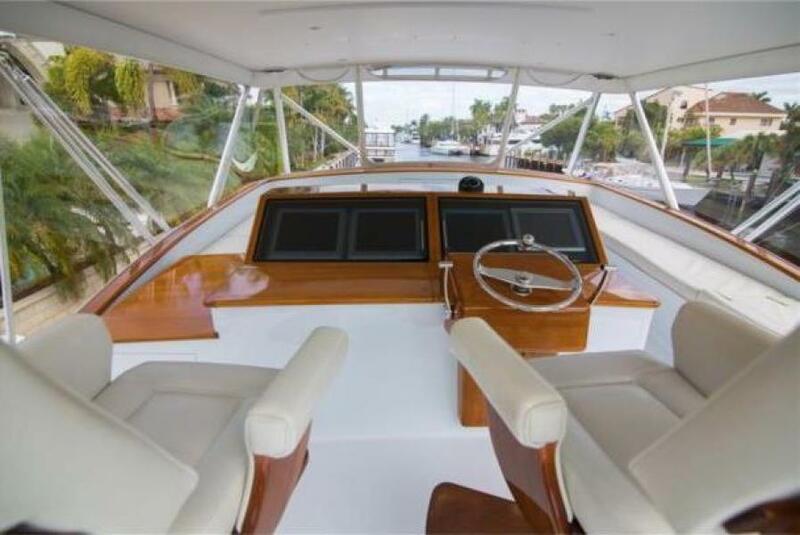 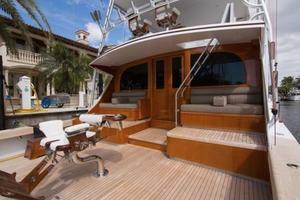 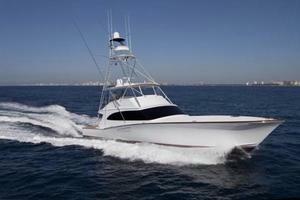 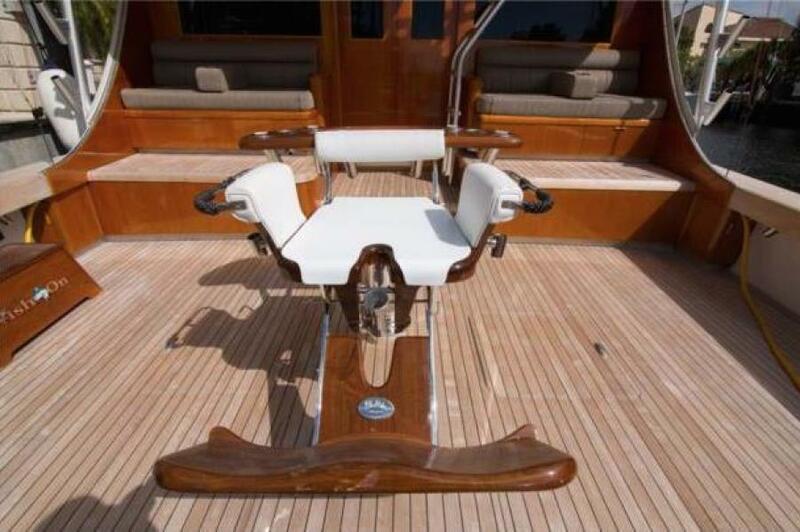 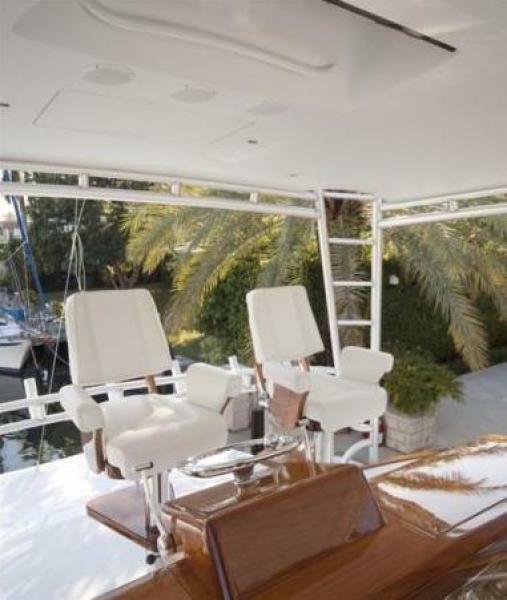 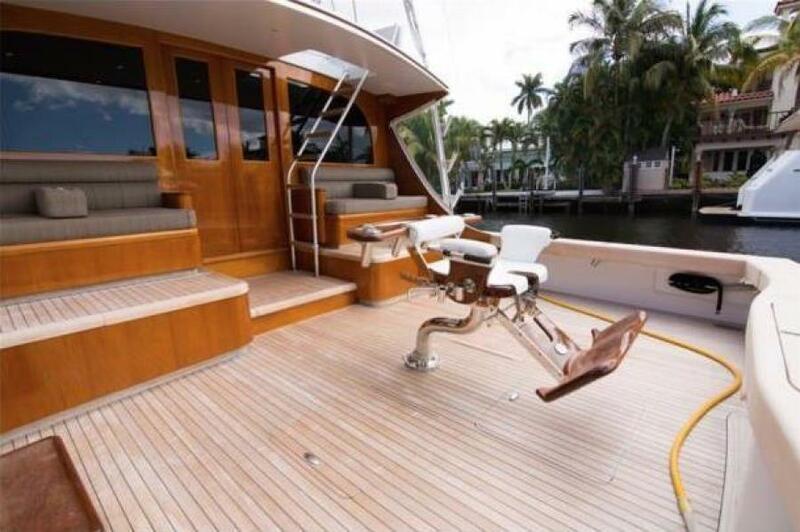 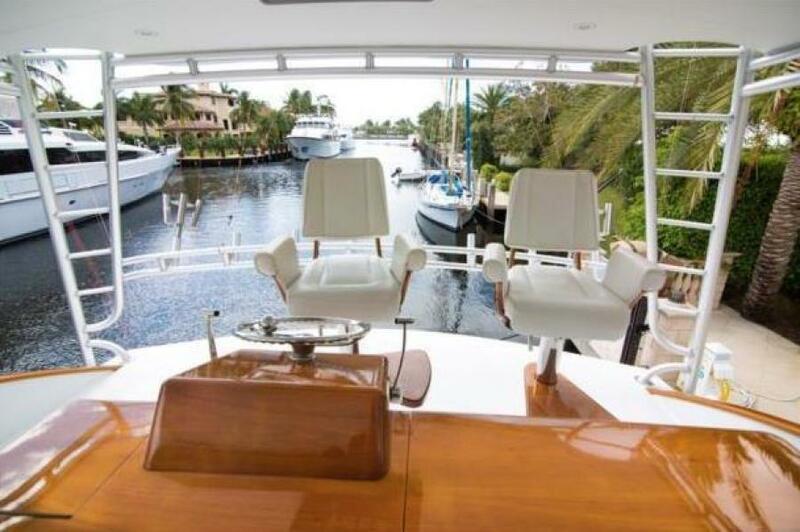 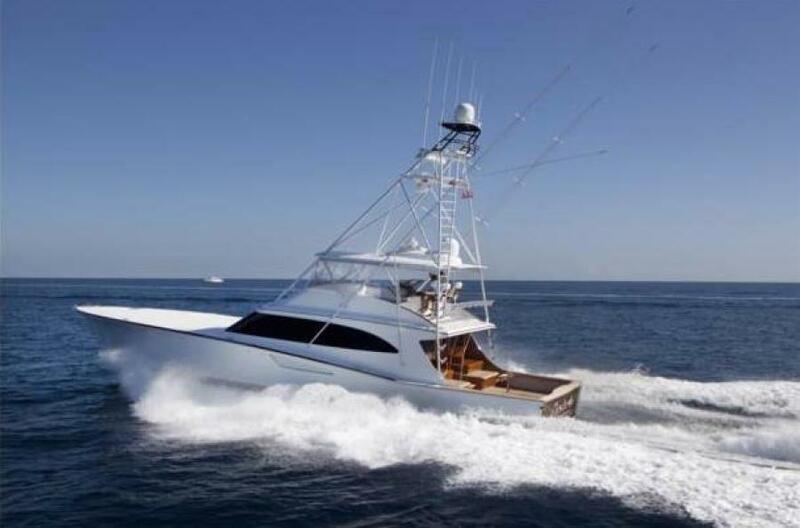 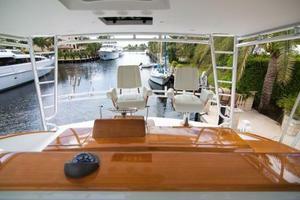 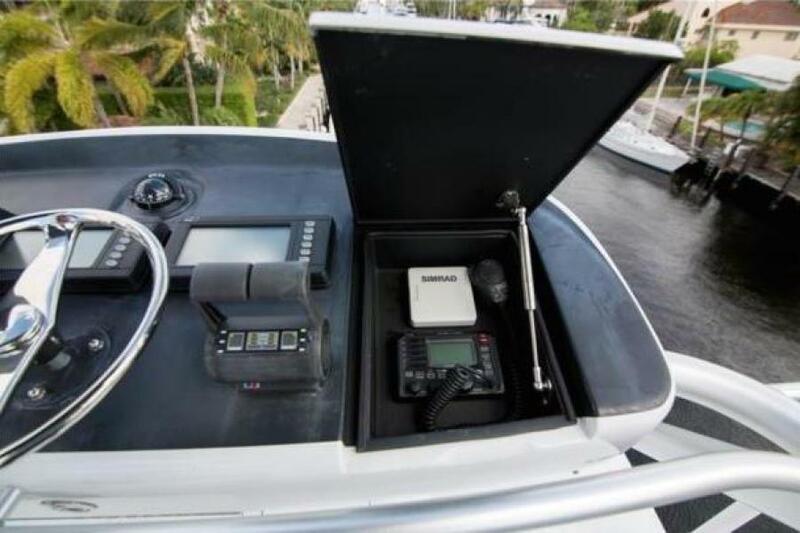 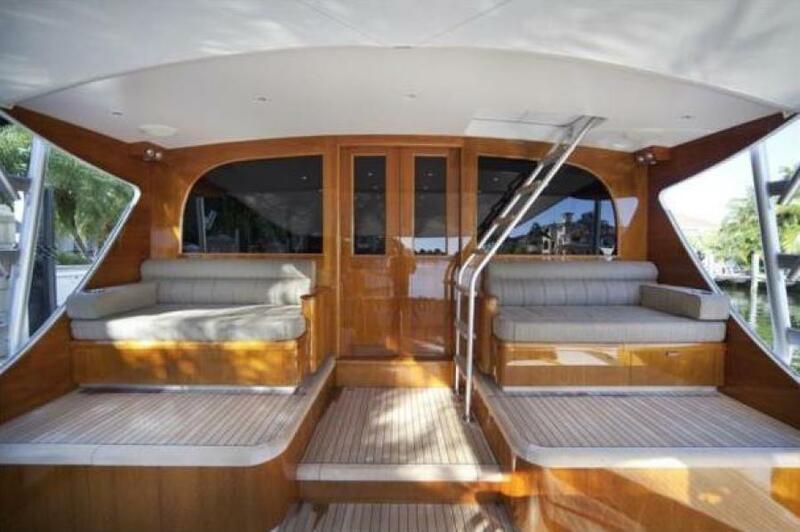 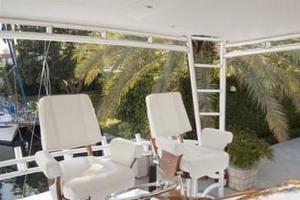 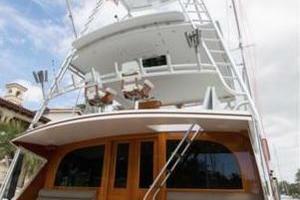 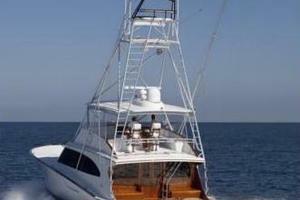 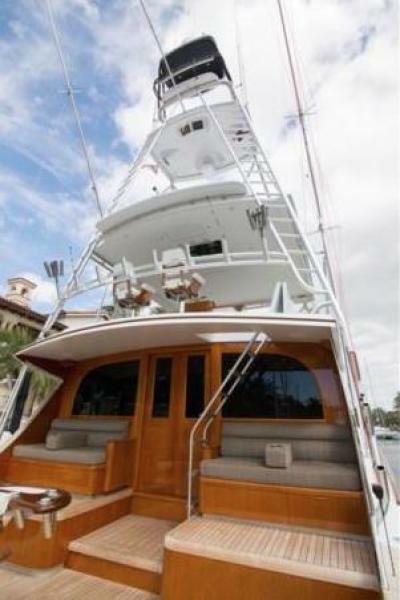 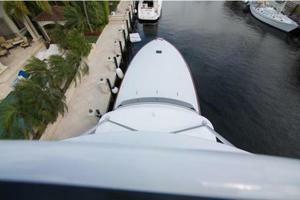 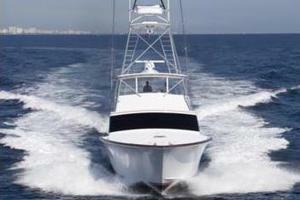 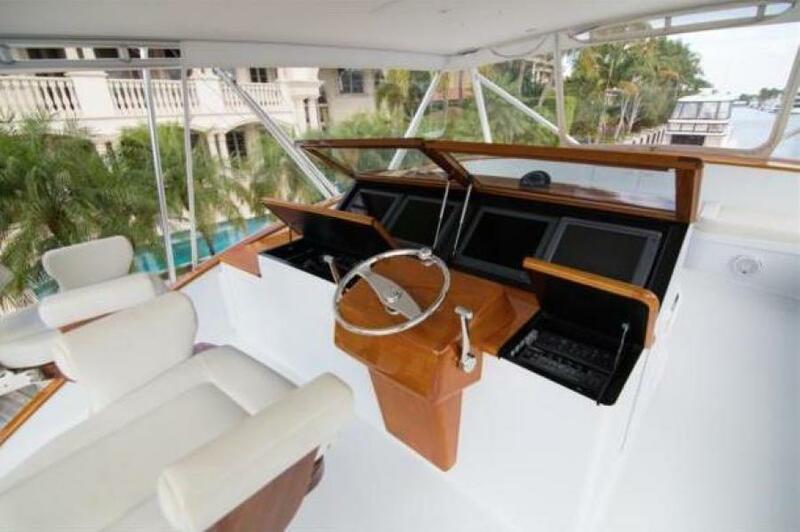 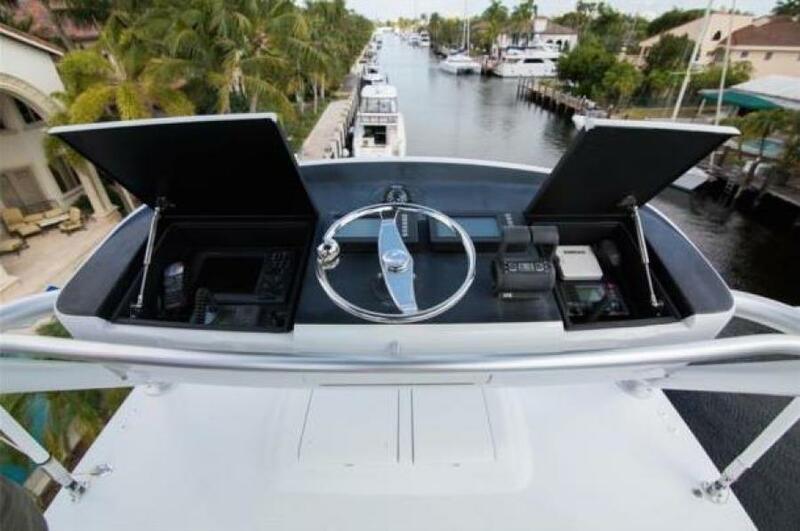 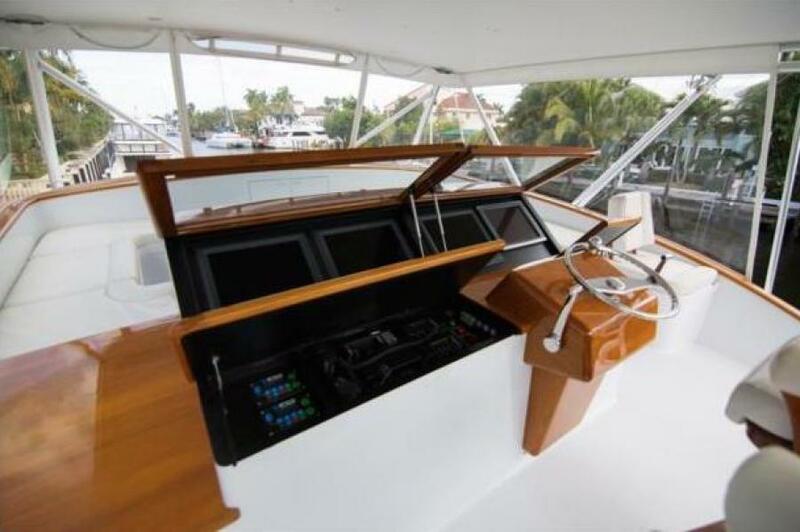 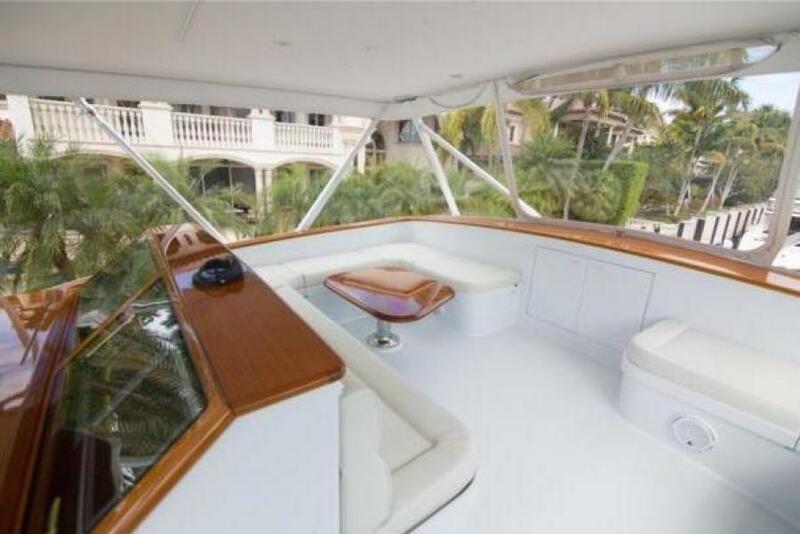 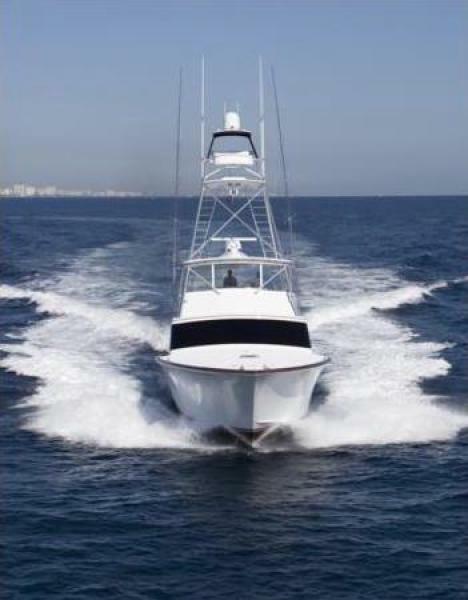 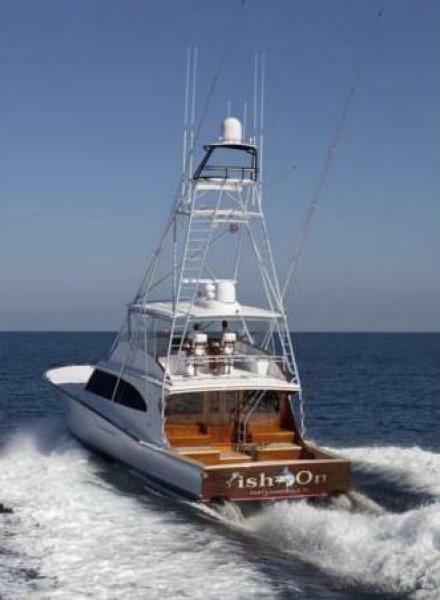 This yacht for sale is located in Jupiter, Florida and priced at $4,495,000. For a showing please contact us by filling out the form on this page and we will get back to you shortly! 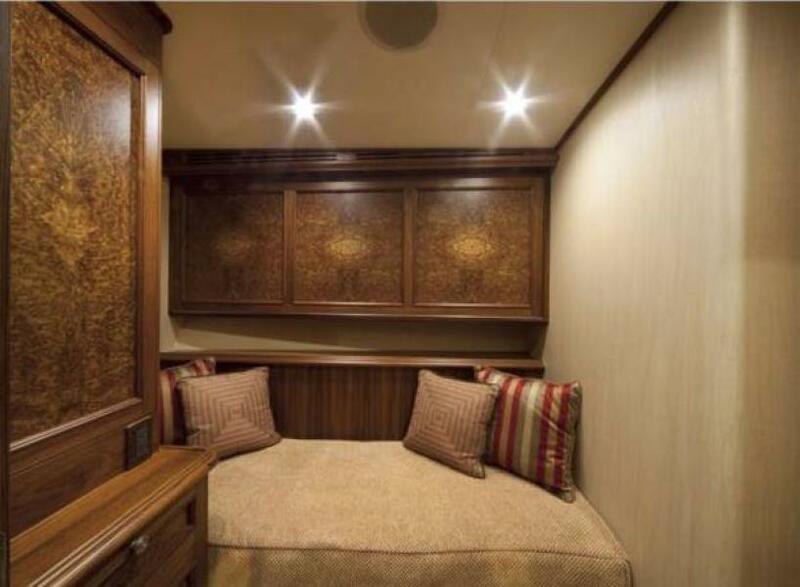 Entering the interior cabin through the pneumatic door to port, the salon features a beautiful Corinthian L-shaped leather sofa with exceptional storage below. Complementing this area is a custom teak hi/lo cocktail table that can also be used for dining. 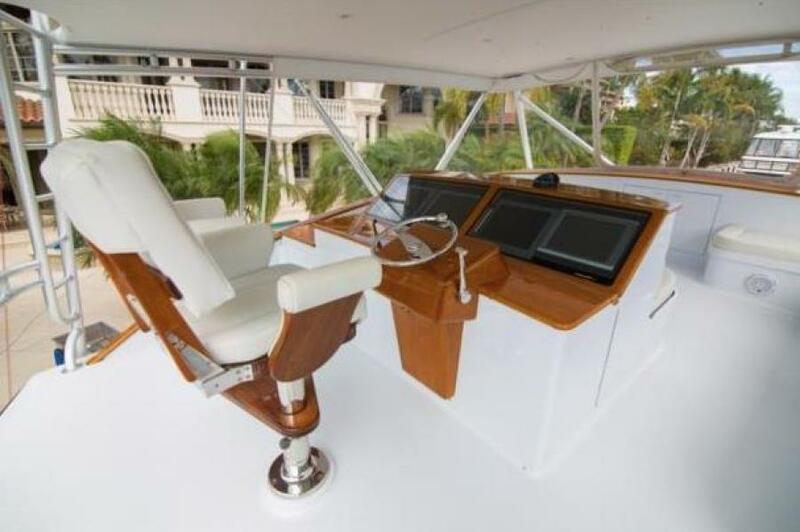 Across to starboard there is an oversized chair with ottoman and full entertainment center with a pop-up 50” Sony Bravia television. 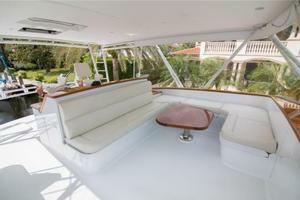 Moving forward to starboard is the extra large dinette area. 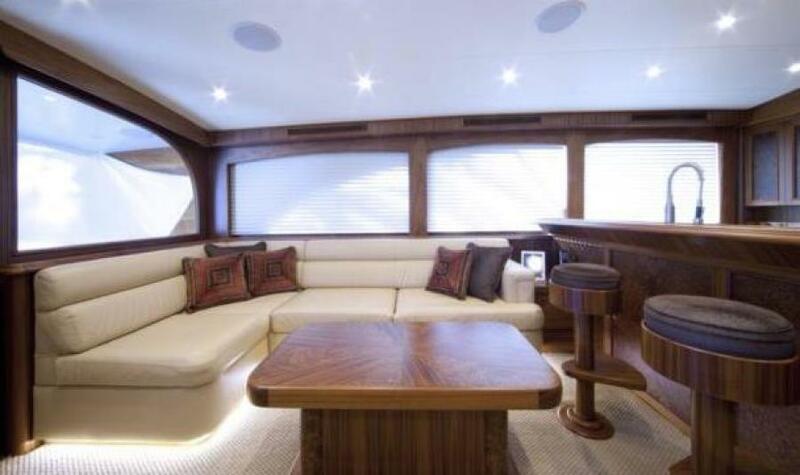 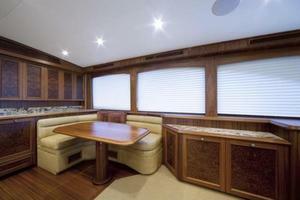 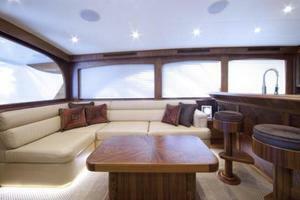 This area features a spectacular teak table, sofa matched leather dinette seating and plenty of storage below. 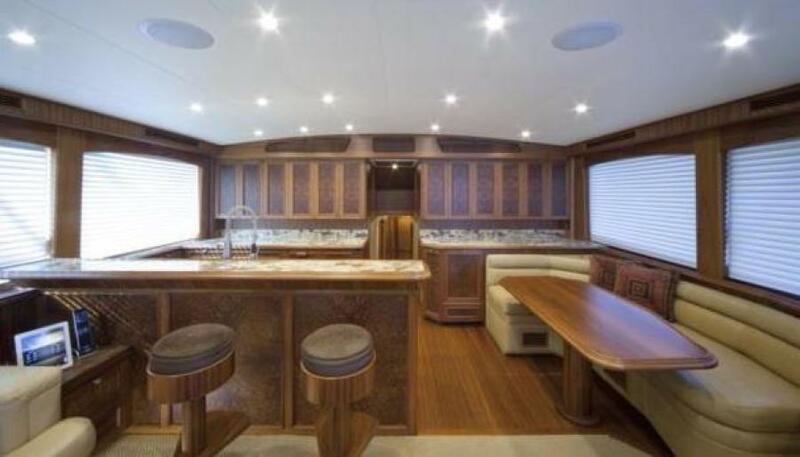 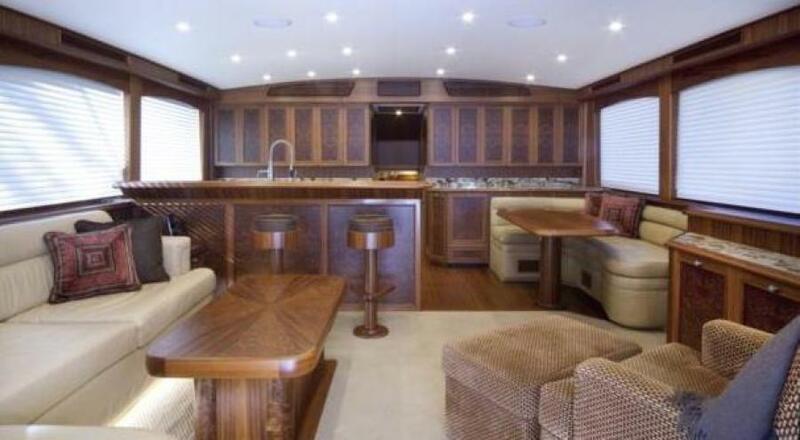 To port is the gourmet galley area showcasing top of the line appliances and tremendous counter space, part of which doubles as a spacious bar area with two custom teak wrapped bar stools. 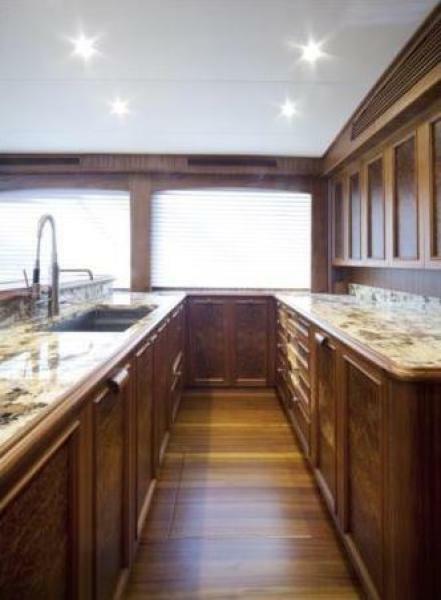 This area features massive under-counter refrigeration and freezer space, fantastic storage, along with an oversized pantry and custom storage for pots and pans. 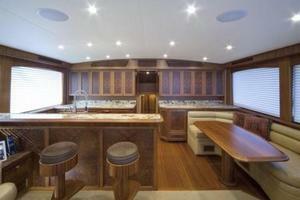 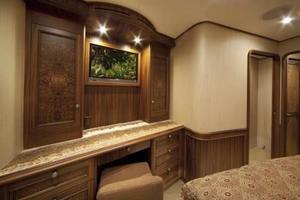 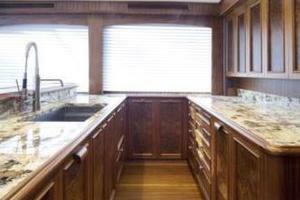 The entire galley area has real teak, satin finished, hardwood floors. 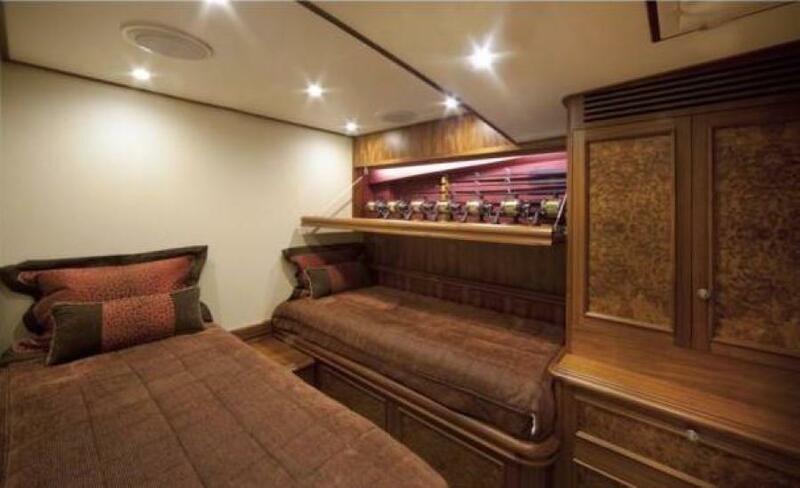 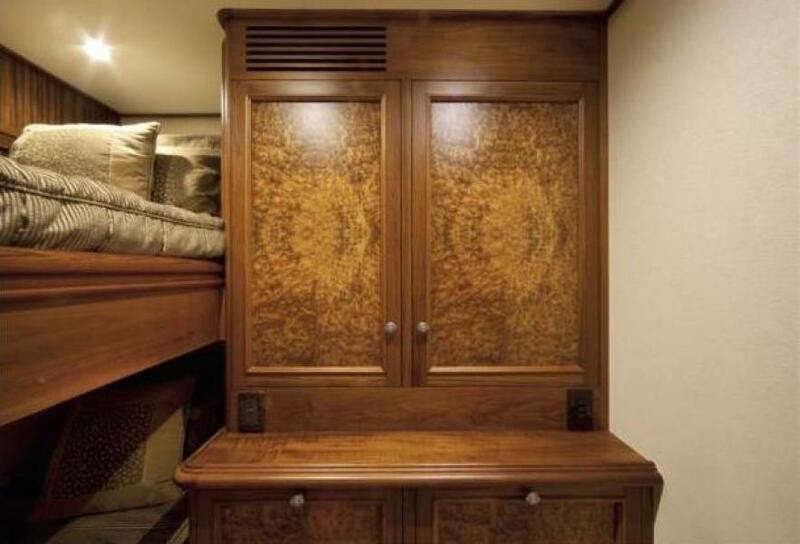 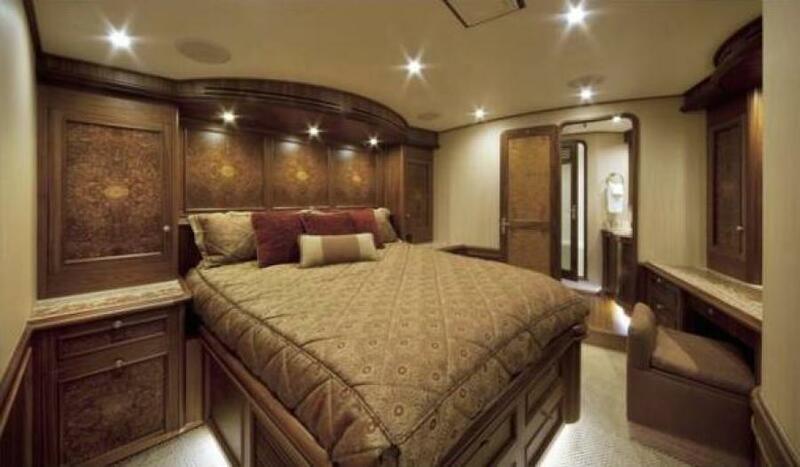 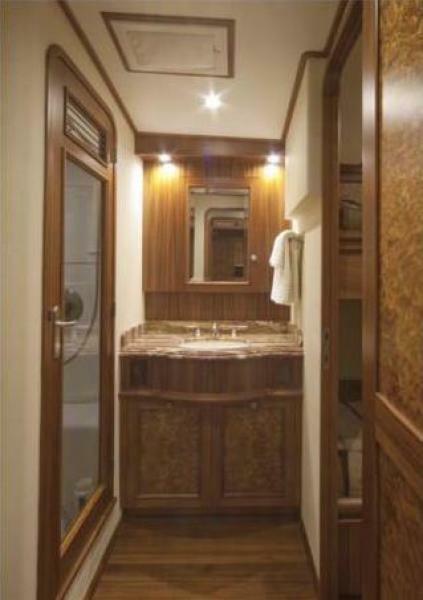 Moving down the companionway to starboard is the guest stateroom featuring oversized over/under berths, great drawer and hanging locker storage. 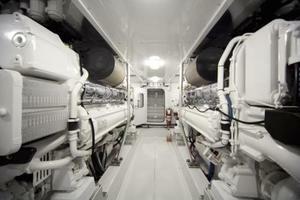 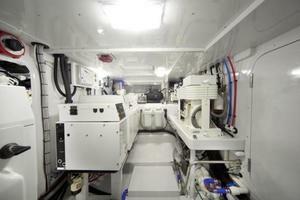 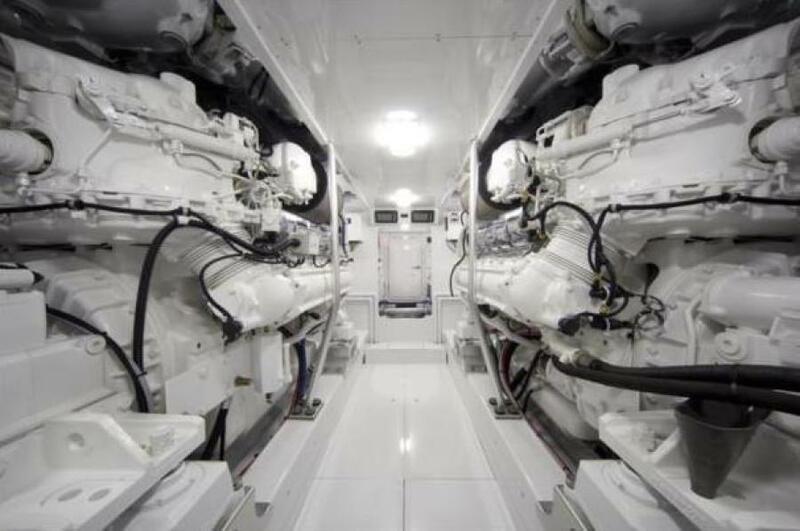 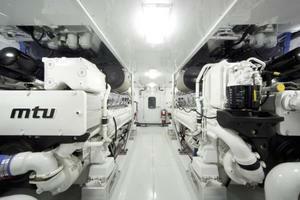 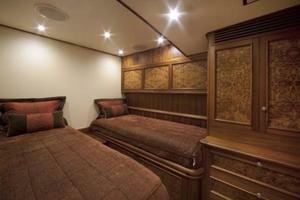 This room can be doubled for crew quarters as it features all of the ship’s monitoring systems. 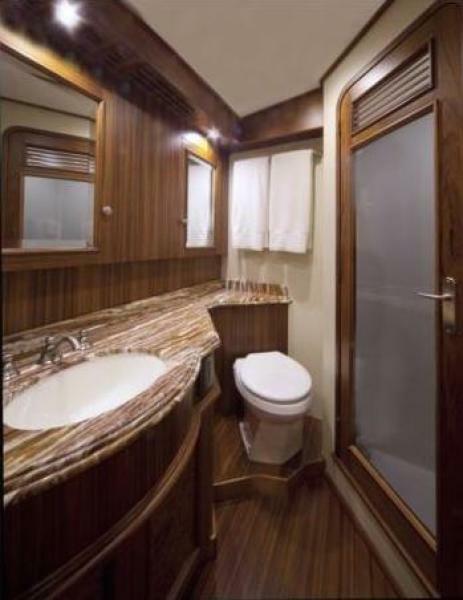 Across to port is the VIP stateroom with side-by-side single bunks, can be converted to a queen berth, and a pullman berth for added sleeping space. 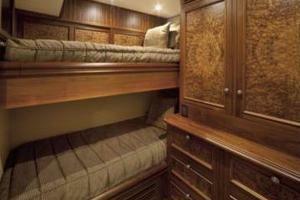 Custom rod and reel storage is located behind the pullman compartment. 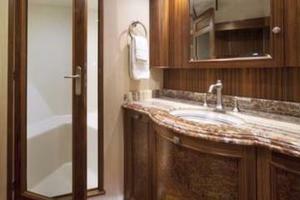 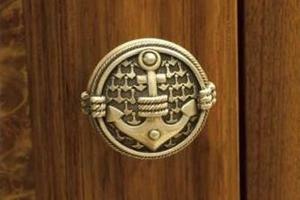 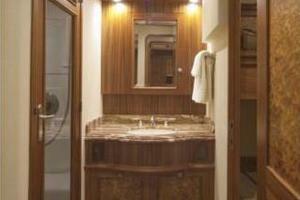 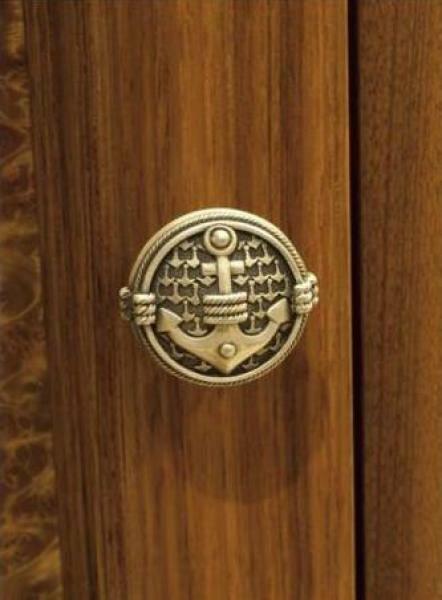 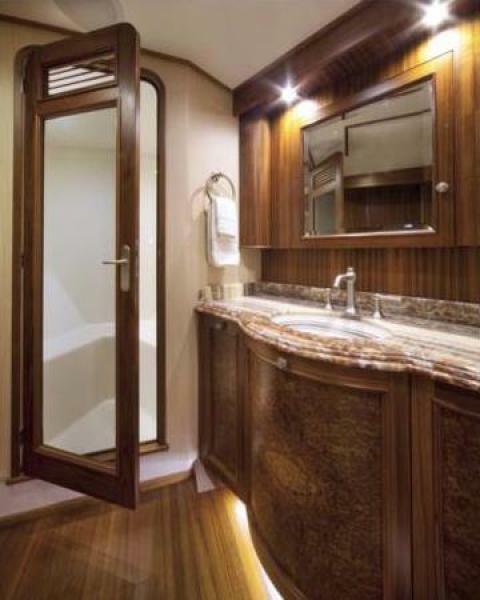 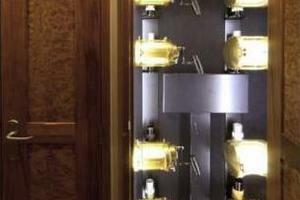 This VIP stateroom has its own large full head and shower with beautiful detail. 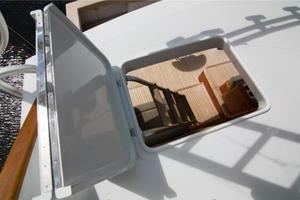 Moving forward to port is the laundry area with a full size washer and dryer. Slightly forward is a huge tackle room currently set up for all the large 80 and 130 pound rods and reels. 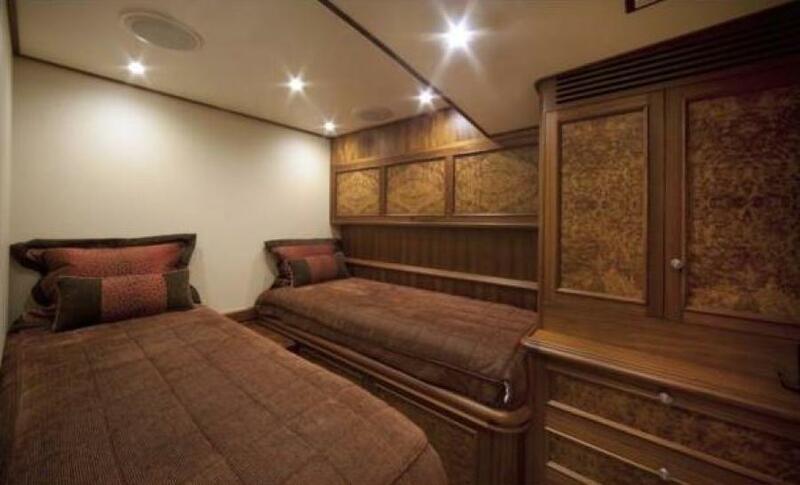 Over to starboard is the other guest stateroom with a single fixed berth plus a pullman for added sleeping space and additional tackle storage. 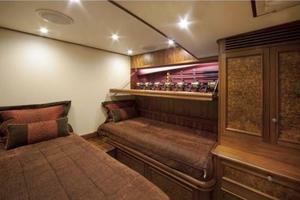 All the way forward houses the master stateroom featuring a walk-around king berth to port with great storage below. 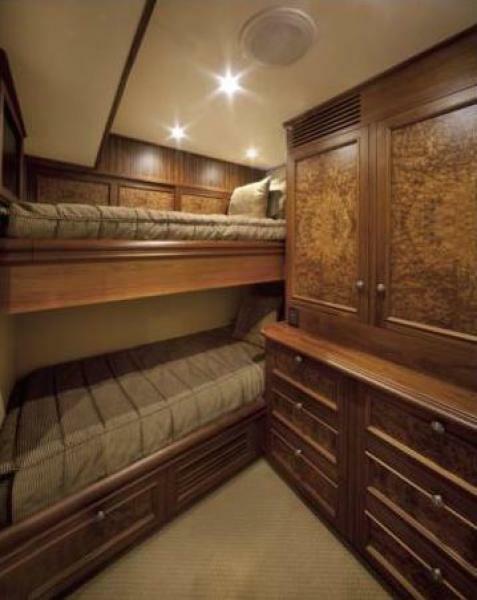 This area is truly spectacular with exceptional storage and closet space along with breathtaking woodwork. 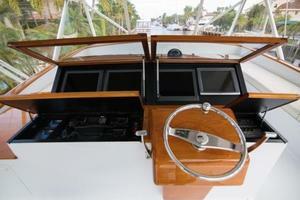 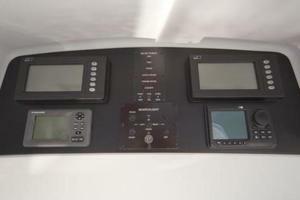 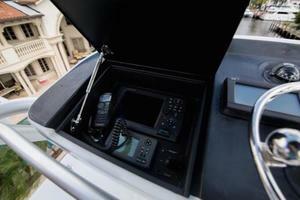 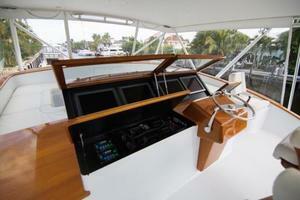 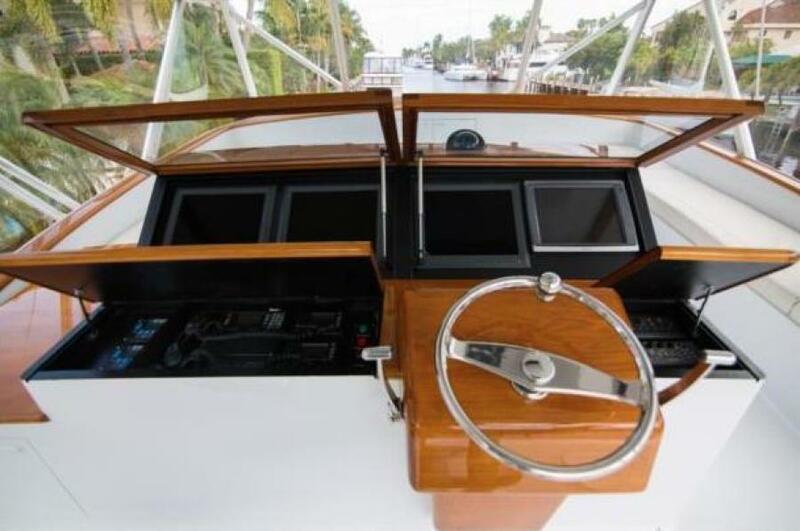 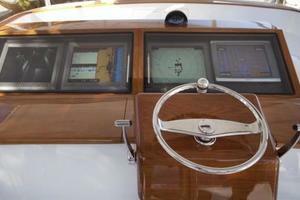 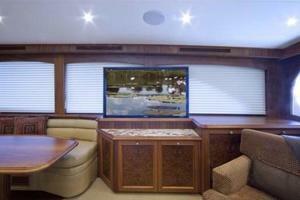 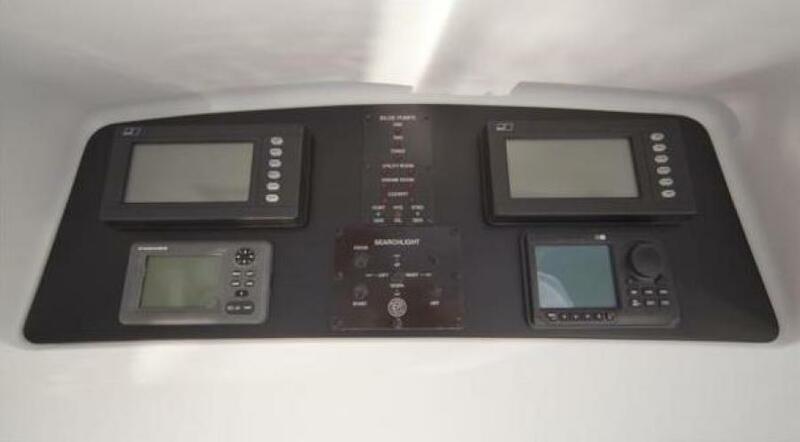 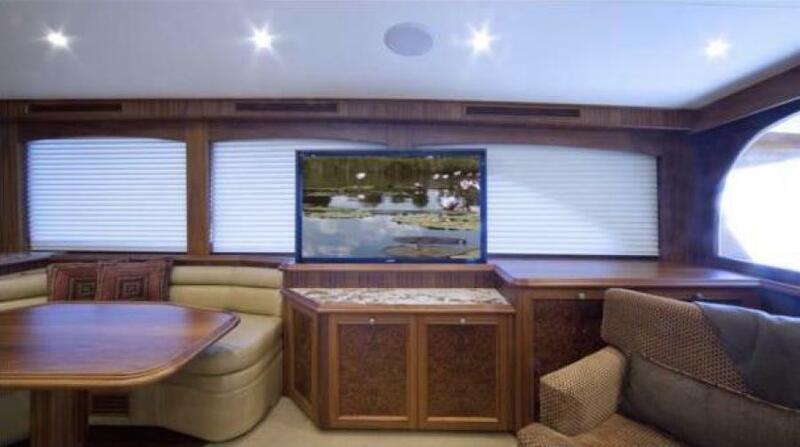 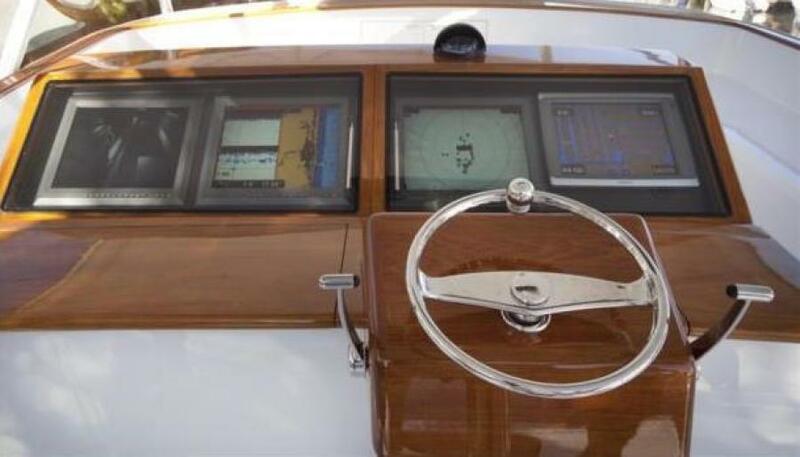 To starboard is the full entertainment center with a 30” Sony flat screen television and surround sound system. 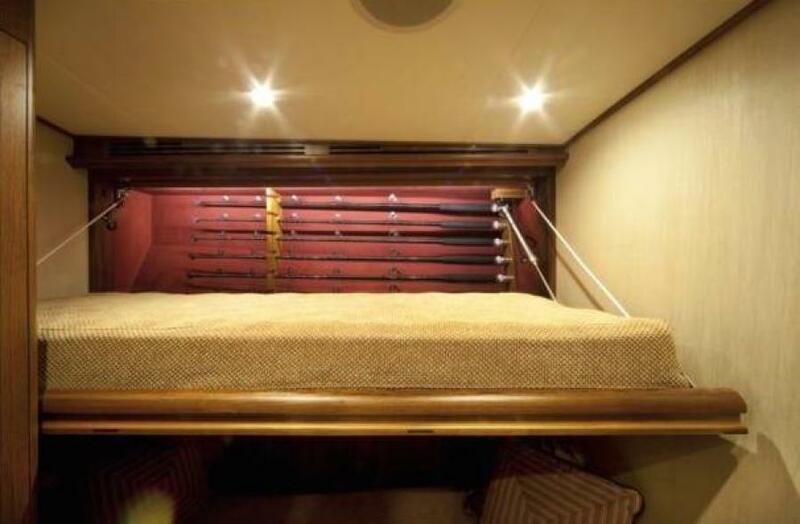 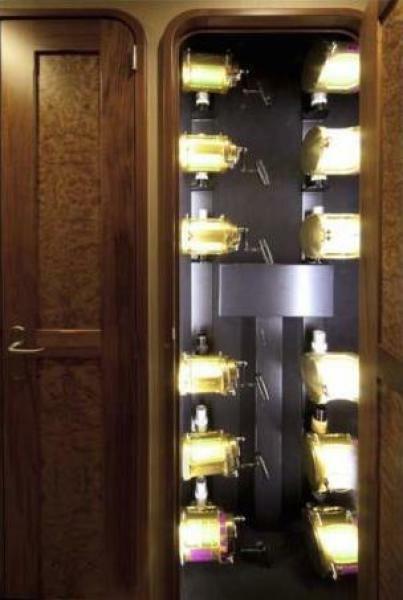 This room also features hidden gun storage for serious artillery. 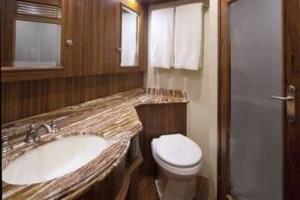 Located in the forepeak is the beautiful full head and shower arranged with storage for everything. 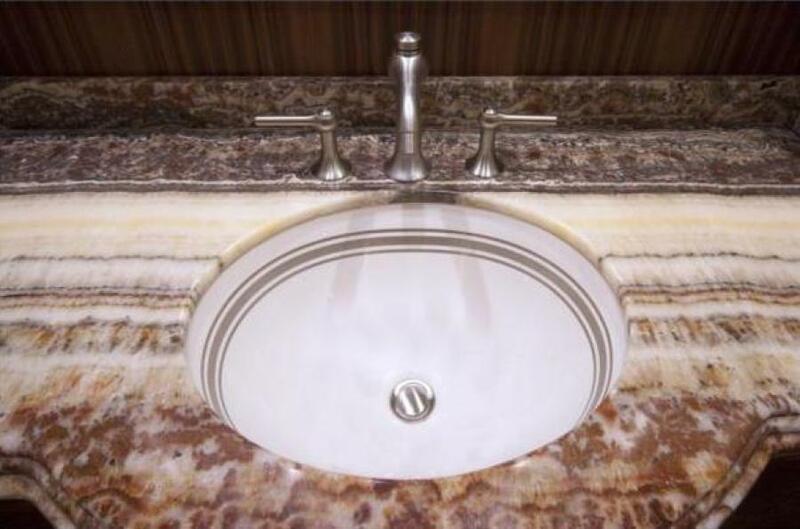 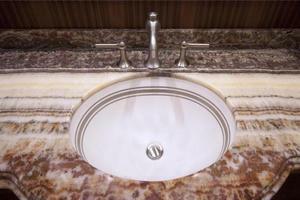 The fine detail and lavish marble work is highly noted.